Do you keep your butter in the refrigerator? You do? Stop it. Stop it right this second. You’re ruining your butter experience and making your toast taste like failure. Let me tell you why. Butter is a wonderful substance. Made by churning cream until it separates into buttermilk and fat globules, butter is not only delicious but also versatile. Butter will make pretty much any food outside of breakfast cereal taste better. 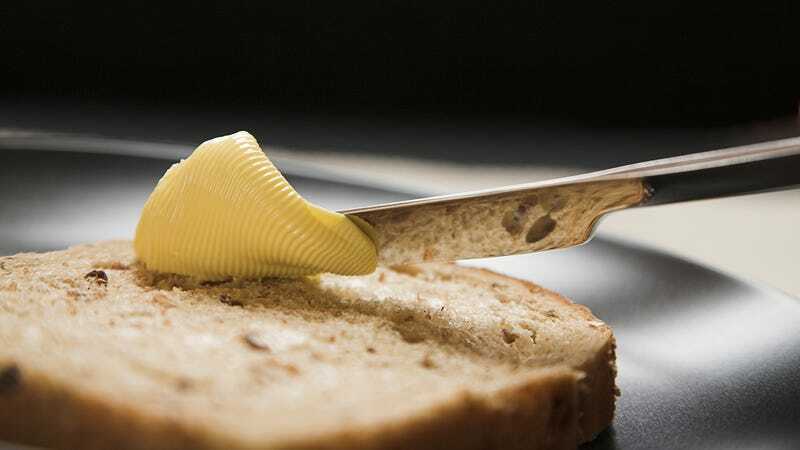 In order to enjoy your butter-on-bread or butter-on-corn, however, you have to be able to spread it. And anyone who’s ever pulled a cold stick of butter out of the fridge with the hopes of smearing that yummy stuff on toast knows that cold butter simply does not spread. Not only does cold butter not spread, it also destroys. Try smearing a cold paddy of butter on a piece of untoasted bread, and you’re going to end up with whole grain carnage. The butter grabs onto the surface of the bread and rips it apart, like a tiller tearing up a garden. If you do manage to get the butter somewhat distributed, you probably won’t notice the deliciousness, because the cold also mutes the flavors. That’s a real bummer, because butter is basically delectable. It doesn’t have to be like this. In fact, most of the world does not suffer from the murderous cold butter problem, because most of the world leaves their butter on the kitchen counter, where it belongs. If you’ve ever visited, say, France, you’ll notice how wonderfully spreadable room temperature butter is. And it’s also more delicious than you’ve given it credit for. Butter is complex! In its guide to butter standards, the United States Department of Agriculture describes the very best butter as “fine and highly pleasing.” The USDA also details 17 different flavor profiles in various types of butter, from “aged” to “malty” to “weed.” Have you ever tasted malty butter? Probably not, because you probably keep your butter in the refrigerator. It’s likely that you keep butter in the fridge because you think it’s safer that way. After all, butter is made from cream, and if you leave cream out in the open for too long, it can go bad. And if you consume bad cream, you could get sick, if not from the rancid taste then certainly from the foreign bacteria that feasted on the stuff when it was out in the open. This line of thinking doesn’t really apply to butter, though, at least not in that extreme. The cream that’s used to make your standard market variety butter is almost always pasteurized, and it takes quite some time for pasteurized dairy products to go bad. Foreign bacteria is still attracted to pasteurized dairy products. Butter can indeed go bad. But as long as you keep it covered, it’s very unlikely that anything bad will happen to the butter before you’ve had a chance to eat it all. Yes, a stick of butter will lose its shape if it gets too warm. That’s a good reason to cool it off. At room temperature, however, the butter will remain cool enough to keep its shape but warm enough to spread smoothly. To keep butter at the ideal temperature, you might consider buying a butter crock or a simple covered butter dish. If you have any doubts about this room temperature butter argument, let me direct you to the USDA guide “How to Buy Butter.” The agency acknowledges that “ready spreadability” requires removing the butter from refrigerator “10 to 15 minutes before use.” It does not, however, warn against keeping the butter at room temperature at all times. Now exactly how long “a while” is totally depends. The FDA wasn’t able to give us a specific timeframe because factors like how much light the butter is exposed to, whether it’s salted or not, and how much bacteria it had in it to begin with will all affect how long it will last. Their expert added say that this strategy works better in cooler climates than in warmer ones. Either way, leaving your butter on the counter in a covered container is perfectly safe, but all things in moderation. So let’s review. Keeping butter in the fridge makes it hard and flavorless. Keeping butter on the counter makes it soft and delicious. As long as it’s done right, leaving butter out at room temperature is also just as safe as leaving it in the fridge. Any questions? This post originally appeared on Gizmodo in August 2014.